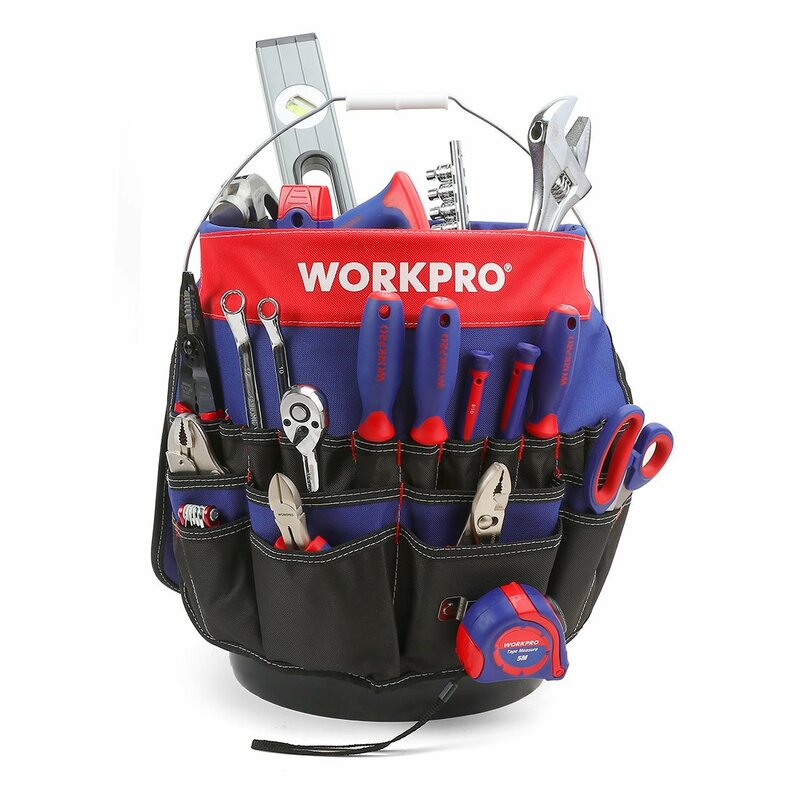 Every homeowner needs a reliable set of tools for home maintenance projects. If you’ve ever tried to tighten a screw using the tip of a butter knife, you have a pretty good idea why. Unfortunately many, if not most, tools are designed and marketed toward men. Tools tend to be heavier and less comfortable for women to hold. That's why you want to take your time when buying tools and wait until you find ones that fit in your hands comfortably. I'll always remember the day I passed 3 hammers around in a group of women. The hammers weighed 8 oz, 13 oz and 16 oz. The smallest hammer was voted the most comfortable, so go with what works for you! And the added bonus of smaller tools is the guys won't like them so they won't disappear as much. Every tool kit needs a good tape measure. You might never measure and cut a piece of lumber (and then again you might! ), but a tape measure helps when you're calculating how much paint to buy (here's our worksheet to estimate how much paint you need). It’s also handy when buying drapes, planning furniture layouts and hanging art on the wall. There are loads of tape measures on the market. In fact you'll probably find it handy to keep several tape measures around your home and one in the car. And watch out as they tend to multiply over time. You'll want a metal tape with a lock that prevents the tape from snapping back inside. That means you can measure out the length you want using the lock to hold the tape just where you want it. Cloth and vinyl tape measures can stretch, so they’re not really accurate for home maintenance and improvement. A screwdriver seems simple enough and you don’t need to spend a fortune. You'll need two different kinds of screwdrivers – those with a flat-head or slot style (tip on the left above) and at least two basic Phillips head screwdrivers. You never know when you'll need a short one or tiny screwdriver head, so buy a mixed set with a range of sizes and styles if you can. Phillips head screwdrivers have a cross-shaped tip that’s blunt at the point (pointing up and to the right above). There are other similar cross styles, but the Phillips blunt tip helps prevent stripping out screws. Flat-head or slot-style screwdrivers have a straight, flat tip. Don’t let the giant claw hammers fool you. You don’t need an enormous model to get most jobs done. And if you choose a hammer that’s larger than you’re comfortable with, it can be dangerous. Always choose one that you can handle without straining. A claw hammer has the standard nail-pulling claw at one end, and a flat end for driving nails. Look for a hammer with a steel shank and a rubber-cushioned grip. With care, it will last you a lifetime. A pry bar resembles a crowbar, but it’s flat and much smaller. This tool lets you slip under nail heads that are too close to the surface for a hammer’s claw to fit, and you can also use it for prying up trim molding. There is another style of pry bar that’s even smaller. It’s called a “nail puller,” or sometimes a “cat’s paw.” It has a small, curved claw at one end, designed for removing even very small nails, and a flat blade at the opposite end for prying. If you’ve ever tried to hang a picture and couldn’t seem to get it straight, you already know how useful a level can be. A torpedo level is small, but works the same as the larger, 4-foot-long models. Levels work in a very simple way. They have a tube filled with liquid and a bit of space inside. When the bubble of air inside is centered in the tube, whatever the tool sits on is level. Look for one that also determines plumb, which is the vertical equivalent of level. This style will have two tubes, one running horizontally and another that runs vertically. Power drills do more than drill holes. With a driver bit attachment set, you can also use it as a high-power screwdriver. The bits fit into a connector called a “chuck” at the end of the drill. The chuck may be adjustable, loosening or tightening to fit the bit, or it can accommodate snap-in bits that lock into place more easily. The well-stocked tool kit is something that evolves over time, and these tools are only the beginning of what you’ll need. There are others that you’ll probably collect as the years go by. Hand saws, pliers in varying styles and sizes, electrical testers, and even more power tools such as a miter saw, might eventually find their way into your home maintenance arsenal. What’s most important is buying good quality. With a $1 set of screwdrivers, you’ll get what you pay for. Look for quality, and you’ll be making an investment instead of buying a tool that will frustrate you and make working around the home more difficult. What tools have you added to your kit? We’d love to hear about the ones you find most useful! PS When Kate asked about a small tool package that's easy to store, I realized one more important tip is a bag or bucket to store your tools. Here's my favorite, an apron that fits over a 5-gallon bucket. It makes it easy to grab and carry anywhere at home or elsewhere, to get small home maintenance projects done without extra trips. I love the info on this site! I feel respected even in my ignorance. I am, at 54, new to determination to be competent with at least two power tools besides my sewing machine and blender. The thing is, we just moved into a studio apartment (450sq feet!!) and need to keep a tool set that will be compact and efficient. We had two pine dressers and a pegboard with my husband’s tools at our old house. I embarked on a couple of projects to settle into this home and discovered that I don’t want to be dependent on him for tool use. I remember seeing a family friend use a Makita set with a little saw and drill and screw driver…and now I have fantasies of a small power tool set that I can manage along with the few hand tools needed. Do you know of any sets that might be more compact to store and easy to use? It looks like the Makita set I remember is from yesteryear. Hi ‘ I’m recently widowed , 52 old . & depended on my husband for the outside work . He was good with a power saw , but no carpentry . I would like a small light weight power tool . Something for cutting wood ? Maybe with interchangeable blades for wood , metal . Do you have any suggestions. Susan, It’s hard to answer your question as I’m not sure if you want the saw to cut firewood? or small carpentry projects around the house. For firewood, you will need a chainsaw, ideally one that’s 14 inches or smaller so you can maneuver it easily. The big decision is electric where you have to deal with moving the extension cord … or a battery operated chain saw which you have to recharge (or buy an extra battery). While I haven’t used this chainsaw from Homeworks (12 in, cordless), I like the fact that it gives you 2 handles to make it easier to control. There are too many different saws for carpentry to suggest one without understanding more about what you plan to use it for. I am glad you mentioned having a torpedo level tool around your home for any repairs and projects. We have a set of tools and are planning on renovating our home this summer. I appreciate the list of tools homeowners need. Thanks & good luck with your summer projects. Really this is an awesome resource for any homeowner to learn what are the most important tools to get. My best home tool is a power drill that can help me in so many ways. Your site has so much great content that’s really good for anyone. Thanks for sharing with us.